This omnivorous Kreature protects itself with a thick, spiny exoskeleton. It has the ability to retract its legs into its body and roll towards its attackers, smashing into them at high speed; it can also launch its spines in parabolic arcs in all directions. 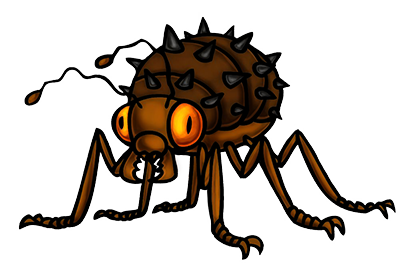 Feral Bugzors will gather in colonies in storm drains, abandoned subway tunnels, and other dark, dingy places, where they'll reproduce in such numbers that they'll cover the walls and ceilings. If their home is invaded, they'll rain spines down upon the intruder.